She is the Founder of the very successful Ultimate Outcomes Coaching & Training Company as well as Happy Trim & Healthy Weight Loss Coaching. She is a qualified Business & Life Coach, NLP Practitioner, E-Disc Consultant and Hypnosis Practitioner. Robyn has worked with one of Australia’s largest Franchise Companies as their National Learning & Development Manager as well as some of Australia’s well-known Training Organisations. She has also worked with many small business owners and individuals bringing out the best in them and helping them reach their goals. 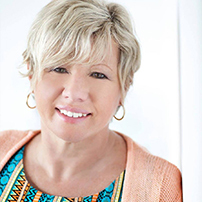 Robyn is a Business Growth and Personal Development specialist, she is a dynamic and inspiring trainer & speaker who has been trained herself by some of the best names in the Country. Robyn’s vision to is help people all over the world find happiness, peace and success, whatever that means to them individually. Robyn believes that we are all here on the earth for a purpose and she truly desires to help people find their purpose and live fulfilling lives. Her mission is to change as many lives for the better all over the world. “My heart is heavy that there is so many unhappy people in this world, and I want to help these people experience joy and happiness, they way that life should be” says Robyn. Robyn supports charities to help the underprivileged and mistreated young people. She is an active Rotarian. Robyn has written many on line programs to assist personal development. She runs workshops and is a sort after personal coach. Robyn is a Mum of 3 a Step Mum of 3 and has 7 grandchildren. She lives with her Husband Andrew in a beautiful coastal area North of Sydney.